Burial location: Christ Church Cemetery, Lakeside, Ontario, Canada. Bombardier William “Hap” Day enlisted the day England declared war. He served in the 12th Field Battery, 7th Canadian Medium Regiment, Royal Candian Artillery. With training at Kingston and Petawawa in Canada and later in England, he qualified as a Signaller. He saw active duty in France, Belgium, Holland and Germany. He was in Holland for the liberation and in Germany when peace was declared. Amongst his medals, the Canadian Volunteer Service Medal and Clasp was the one that he was most proud of receiving. 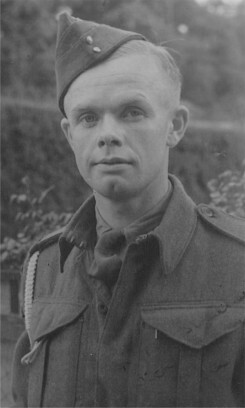 He was also awarded the 1939-1945 Star, France and Germany Star, Defence Medal and War Medal 1939-45. He was honourably discharged in August 1945 and upon returning to Canada, he and his wife Fern took up farming in Lakeside and ran Day Bus Lines for many years. They raised 6 children: Ross, Joyce, Jim, Vivian, Keith and Glenna.